Tomorrow, December 7th is the 100th birthday of Leigh Brackett. Leigh Brackett’s science fiction output dwindled with the death of the pulp magazines. She produced three stories per year 1950-54 for the science fiction magazines. She had two stories in 1955, the year most science fiction pulp magazines died and one of those stories was for a science fiction digest magazine (Magazine of Fantasy & Science Fiction). Robert P. Mills, editor of Venture Science Fiction must have had a good relationship with Leigh Brackett as she had two stories in that magazine. Venture was a short lived magazine in digest format that was a companion to The Magazine of Fantasy & Science Fiction. It delivered high quality science fiction, some stories could be characterized as “thinking man’s space opera,” other fiction was more out of the ordinary. Unfortunately, Venture lasted for only ten issues. The late 1950s were given over to the crime novels An Eye For an Eye (1957) and The Tiger Among Us (1957) in addition to screenwriting work. Brackett wrote the movie novelization for Rio Bravo in 1959. She wrote the mountain man novel Follow the Free Wind that won a Spur Award in 1963. 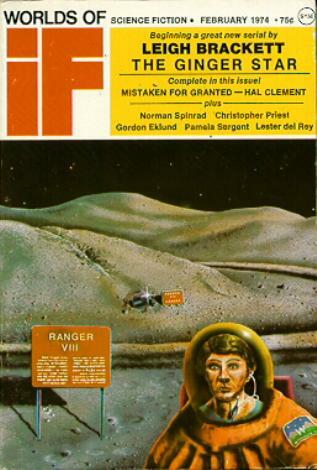 Brackett would return to science fiction in 1963 for Amazing Stories and the 15th anniversary issue of Magazine of Fantasy & Science Fiction in 1964. There was a final burst of new science fiction from Leigh Brackett first with three stories for Roger Elwood edited anthologies in 1973-74. This is surprising in hindsight considering Roger Elwood is not well thought of today by some of those who dealt with him. He is also blamed for crashing the original science fiction anthology market back in the day with a torrent of mediocre to bad anthologies that sold poorly. A short version of the novel appeared first in two issues of World of If in the January/Febrary and March/April 1974 issues. The paperback from Ballantine Books followed in May 1974 with a stunning cover by Jim Steranko. Brackett took Stark out of the solar system. The story starts on the planet called Pax, in the Vega system. Pax is the administrative center for the Galactic Union. “A paper world, full of paper people.” Brackett had first used Pax in “Last Call From Sector 9G” in the Summer 1955 (and last) issue of Planet Stories. So, there is something of a reset of the series but nothing to contradict the pulp era stories. Simon Ashton has gone missing on a newly discovered planet, Skaith “out in the Orion Spur” four months ealier. Skaith has a weak, ginger colored star. Stark travels to the one space port, Skeg, on Skaith. Stark starts making inquiries about Simon Ashton and before long he had caught the attention of the Wandsmen. The Wandsmen are the rulers of Skaith. They redistribute the results of labor from the producers to the parasitical Farers. The Wayfarers are used as mobs to put down any dissent. Brackett’s Skaith books are commentary on the welfare state and the creeping totalitarianism inherent in such systems. The Farers are send ups of hippies. They are lazy, unkempt in appearance, and like to use drugs (“love-weed”). Stark had a brush in the water escaping Gelb the Wandsmen and his Farers with the Children of the Sea-Our-Mother, a genetically modified ocean dwelling offshoot of the humans of Skaith. They are also very deadly. He falls in with a group from the city of Irnan that are looking for Stark. It turns out a wise woman has prophesied a Dark Man who would break the power of the Wandsmen. They are captured outside of Irnan and placed in the city square for execution. The Wandsmen bring the wise woman’s daughter to denounce her mother’s prophecy. They have already murdered the original wise woman. Things don’t go as planned as a revolt of the inhabitants of Irnan kill the chief Wandsman of Irnan and his Farer mob. The rumor is Simon Ashton might be at the Citadel, the Wandsmen control center far to the north. There are capture, rescue by the Gray Men, a fight with the iron working Thyrans and capture. Abduction by subterranean Children of Skaith-Our Mother and another escape by Stark leaving Gerrith, the wise woman behind. Starks confronts the telepathic Northhounds, very large guard dogs who use fear to paralyze their prey. Stark kills the Alpha dog and uses them to storm the Citadel. At the end, Stark finds Simon Ashton, drives out the Lords Protector, and sets fire to the Citadel. Skaith is a slowly dying world. A weak sun, a worn out planet, starvation is always lurking around the corner with total collapse in the future. It is in some ways like Clark Ashton Smith’s Zothique. 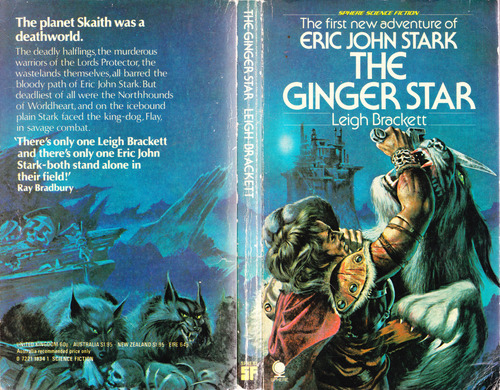 I first read Leigh Brackett after a brief mention in the old Avon Reader’s Guide to Fantasy in the short history of fantasy within the book. 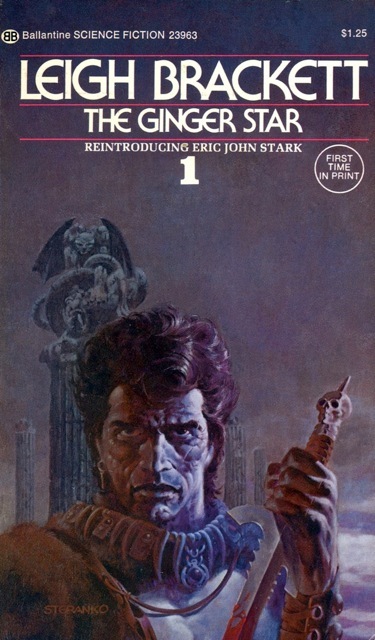 My first Brackett book was The Reavers of Skaith, the last in the trilogy. I then read the earlier Stark stories set on Mars and the excellent collection, The Halfling and Others. About nine months after reading Reavers, I found copies of The Ginger Star and The Hounds of Skaith. At this time, I had not read enough bad fiction to realize how good this trilogy was. I was reading top-shelf fiction for a one and a half to two year period. It was later when I was picking up anything that sounded interesting at used bookstores that I got into the mediocre and dreck. I am amazed on rereading this series on how good a writer Leigh Brackett really was. There is a lot packed into 186 pages. My guess is The Ginger Star is about 75,000 to 80,000 words. Brackett is extremely efficient in world building without info-dump. Some reviews of the books have the complaint that Stark is somewhat passive. He was in the original three Planet Stories novellas. Things happen to him until he can turn the situation around. He is not the Continental Op in Red Harvest or Sam Spade in The Maltese Falcon manipulating the situation. He is more on the lines of Raymond Chandler’s Mallory/Carmody/Dalmas/Philip Marlowe plunging into a case and getting carried along by events and reacting when the situation allows. Brackett’s action scenes are among the best she has ever written. She had a spunky warrior woman, Breca, who goes down quickly against the Thyrans instead of her kicking all their asses. Skaith also is not a regurgitation of what she had done previously in the Martian stories in the 1940s. There are new things, commentary, and most of all a writer at the top of her game. Reading these books is a good antidote to George R. R. Martin’s Game of Thrones.